A 25-year old man of Kalinago Territory is serving eight years in prison at Stock Farm for killing his grand uncle with an axe at Crayfish River in the early morning hours of Monday January 13, 2014. Donald Massicott who was 23 years old at the time of the death of his relative was originally charged with murder, but the office of the Director of Public Prosecutions reduced the charge to manslaughter to which Massicott pleaded guilty to on Monday May 11, 2015. Sentencing did not come through during the May session because of the preparation of a social inquiry report. So on Friday July 17 resident judge Justice Errol Thomas adjourned sentencing to the September session. Defence lawyer Kondwani Williams mitigated on behalf of Donald Massicott. The evidence presented in the case was given by Director of Public Prosecutions Evelina Baptiste on Wednesday September 30. On January 12, 2014, the day before the death of John Tyson, 52, Tyson's daughter Marian saw her father and Massicott at the back of the home of Timothy Viville alias Baykae where the grand uncle and great nephew lived. About half an hour later at about 8:00am Massicott was seen entering Baykae's house and spent the day in his bedroom. That same Sunday January 12 and going past midnight the prisoner and about four others were chilling and drinking in Jeff Shop in Bataca. Sometime after midnight they began walking towards Crayfish River. On dropping two of the female companions at their home the prisoner left on his own without waiting for his friend St Hilaire Lorian. About 12:40am on Monday January 13, 2015 Baykae was in his bedroom when he heard footsteps walking past his bedroom towards the outside bathroom. About 10 minutes later he heard the returning footsteps and sounds like someone washing his hands. Shortly after that Baykae heard someone gasping for breath. He took his flashlight and went to the deceased bedroom. He saw the deceased on the bed with his head up watching the roof. Baykae turned on the lights and noticed that the deceased John Tyson's face, mouth and nose covered with blood. He woke up Marian who was 14 years old then. Marian saw her father's state and began crying. She went to a neighbour Louisiana Burton who came to the house along with her boyfriend. About 1 o'clock that same morning that same Monday morning St Hilaire who was making his way back to Bataca heard rapid footsteps running towards him. He stopped and to his surprise saw it was Donald Massicott. The prisoner rushed towards him and said: "My brother, look that plastic hold it. Meat than in it! I going and duck something; meet me by the Source steps." St Hilaire continued walking and met up with Massicott as arranged. Massicott told him: "Boy, I kill my uncle." He then saw Massicott throw something to the eastern side of Source road. St Hilaire asked what it was, and Massicott replied: "My brother you doesn't never trust me. I telling you something you still asking?" The prisoner told St Hilaire "I hit my uncle plenty times with an axe while he was asleep and left him wheezing and gasping for breath…"
His uncle was stressing him out, he said. He owed the deceased some money and every day the deceased was saying to him he was hungry. He wanted to smoke so give him some small change. Williams would tell the court that Massicott used marijuana and cocaine and brought crack cocaine for his uncle. Williams put in a moving plea on behalf of Donald Massicott. 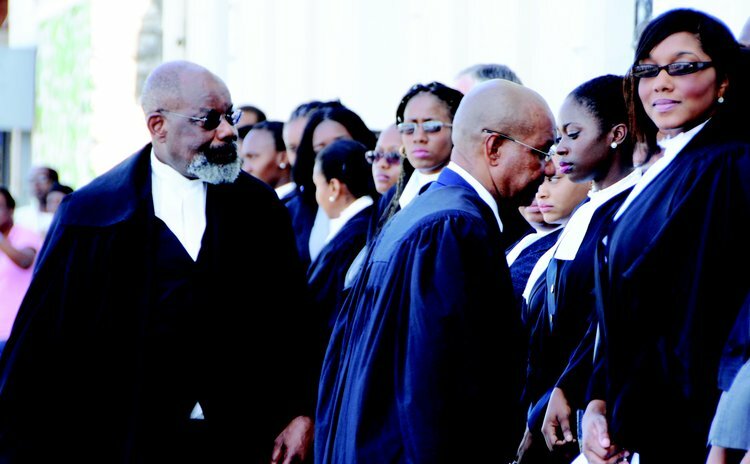 Judge Errol Thomas, after taking into account the background of the prisoner, his guilty plea and youthfulness sentenced him to eight years in prison with time on remand to be taken into account.